Details on how to win a copy of Silence Fallen at the end of this review along with a link to purchase the book from Amazon, and an indie bookstore where a portion goes to help support KRL. Mercedes Thompson is a simple Volkswagen mechanic living in the Tri-Cities area of Washington, but then maybe she isn’t so simple since she has the ability to take the form of a coyote at will. She is also surrounded by supernatural beings, including werewolves, vampires, and fae. In Silence Fallen, Patricia Briggs latest Mercy Thompson novel, Mercy sets out just to get chocolate chips and eggs to make chocolate chip cookies and chaos happens. She is attacked and kidnapped by the most powerful vampire in the world and is taken far away from home and friends. Being Mercy she escapes, but then finds herself far from home without clothes or money. And if you have ever traveled and forgotten anything or been evacuated in a hurry, you’re wincing in sympathetic pain. This book is a rollercoaster ride, and it starts with a huge drop. I was very impressed with how well Mercy coped with being so far outside her comfort zone. But it was helpful that Charles (one of the many werewolves in her life), sometime in the past had given her a blue print of what to do. And yes sometimes the kindness of strangers absolutely touches your heart and leaves you humbled. We get much more of Adam’s point of view this time. Most of the books have been primarily from Mercy’s point of view. But in this one, to round out the action you need Adam, to see what’s going on to help recover Mercy, and their strategic thinking and planning. The master vampire is responding to something that happened in the previous book “Fire Touched.” He was combining concern over repercussions, testing vulnerabilities, and pushing boundaries all at once. Then trying to use other people to fix what he has let go wrong…way too convoluted and byzantine. I enjoyed the book a lot. I do love both the series that Patricia Briggs has in this world very much, and I look forward each year to next book. Patricia Briggs books just keep getting better and better, more depth and passion. Mostly people working together and trying to build better lives and married couples working through problems to become better partners. Yes, this is a paranormal world, but people are people, some nice, some not so nice, and some that just need to be eliminated. To enter to win a copy of Silence Fallen, simply email KRL at krlcontests@gmail[dot]com by replacing the [dot] with a period, and with the subject line “fallen,” or comment on this article. A winner will be chosen April 8, 2017. U.S. residents only. If entering via email please include your mailing address, and if via comment please include your email address. I am so excited about this latest installation in the Mercy series!!! I am a huge fan of the Mercy Thompson series. Winning this would make my week! Can’t wait to hear more from Adams POV! Andrew.r.hotchkiss@gmail.com. hoping no to win. I love these books and look forward to more! I very much enjoyed the surprise at thr end as well as Adam’s POV. Oh! It would be great to win! Love Mercy and Adam. Wish they were real people. I love Patricia Briggs’ characters. Love love love her books! Can’t wait to read tis one. I really enjoyed your review of Silence Fallen. Its a very good book! Love the fact that we see more from Adams point of you. Also its awesome to know or well let’s say to have more affirmation that Mercy is Brans daughter of his heart if not by blood! I agree, I love her books and Patricia Brooks DOES keep getting better and better with each new book! The Mercy series is my favorite, however. 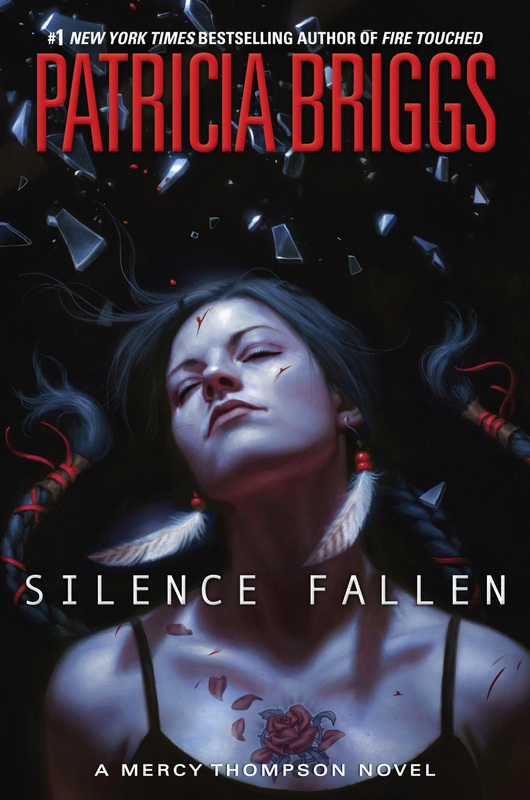 It would be a thrill to win a copy of “Silence Fallen”. This book was amazing – I reread it directly after finishing it. Nice twist – had to revisit with different eyes. Keep up the good work – no one is ready to let go of any of these characters. I was totally caught off guard by the twist. I will need to reread the book to see if I see if coming the second time around. Great review. Love this series! I would love this Mercy book! I lost all my others in my old house. I’m still trying to rebuy the 100+ books I used to have. Got me hooked on these books. I love the Mercy Series! The audio books are great for the commute too! I love the Mercy series and the audio books are great for commuting too! Good review. I already want to read this book, and your review just made it more encouraging to do so! Hoping I win, too, because I’m trying to collect the series! Love this author, Love her “Mercyverse”, hope she continues writing such engaging characters, full of all our normal follies but fiercely brave and true yo the ones they love. Love Mercy books! Such a great series, Thank you for the giveaway. I couldn’t believe this last book! I was on the edge of my seat the whole time! I can’t wait to see what she comes up with next! ? I love Patricia Briggs!! She is the best author ever!! Mercy is amazing! The fact I am also in the Tri-Cities makes it even better!!! I love Mercy and I’m so ready to read the next book in her series. I love all of Patritia Briggs books and would love a copy of this one! I can’t wait to read SILENCE FALLEN! Patricia is so talented. I would be so happy to win this it’s my favorite series!!! Love your Mercy series and your work! this book was awesome! I love new characters and to have back stories for the characters that already existing is great! I missed zee and tad but Adams POV made up for it! I cannot believe how addictive this series is. From the first page, you are hooked! Love Mercy and all her friends. I am big fan. Love this series and all of her books. Loved the twist at the end….but I kept wondering who he really was. Mercy Thompson is an inspiration, she deals with so many different beings but always comes out on top. Thankfully she has many in her corner th help. I have all of the mercy books and the alpha Omega books, I love Patricia’s work… I would love to win a copy of this book!!!! Love ?? this series! All her books intrigue me! I have loved every book in this series! Briggs is one of those writers that just snaps you in from the first page and never lets you go. And you always want MORE! I had the same reaction to that twist at the end! I never saw it coming. I love the Mercy Thompsons series, and agree that the books haven’t fallen off in story or character! Patricia Briggs keeps finding ways to make us want to stay in Mercy’s world and see what trouble she can dig up!! Funny how I came about this author. Years ago one of my sisters had a boyfriend who was two-timing her and I was about ready to beat him up because of it. Then he went to jail and we never heard from him again. I found Cry Wolf in a denim jacket he had left at our house and since then Patricia Briggs has been my favorite author. Looks interesting I’m new. I want to read it. Thanks for all of the entries! We have a winner!